My family lives on the east coast of Florida, so we are no stranger to beaches, palm trees, and warm weather. But driving across the state to visit Sarasota felt like the perfect tropical getaway with my two youngest. 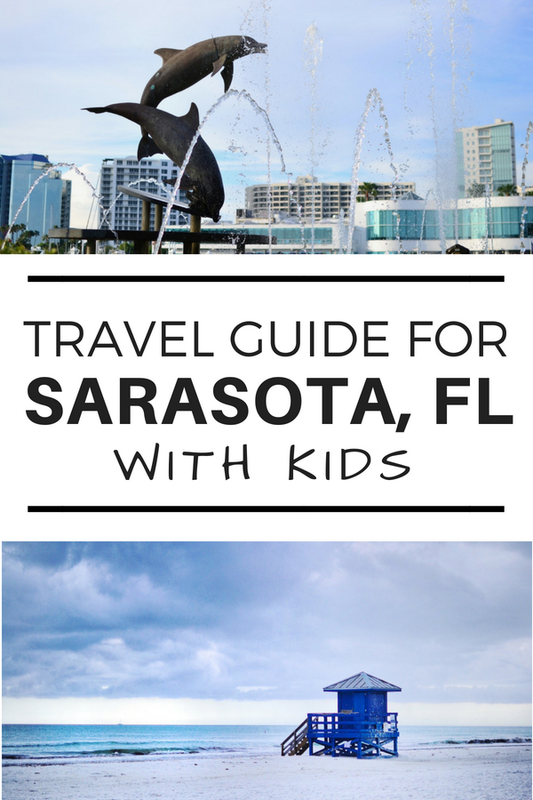 My boys are 2 and 13 months, so I'm always on the lookout for kid-friendly locations whenever I travel, and Sarasota was bursting at the seams! In order to help you cut down on your research time, I'm going to share a few of my favorite spots in Sarasota that accommodate families and encourage little ones to explore. Remember, mamas: traveling with kids is NOT EASY, but the more you do it, the easier it gets. 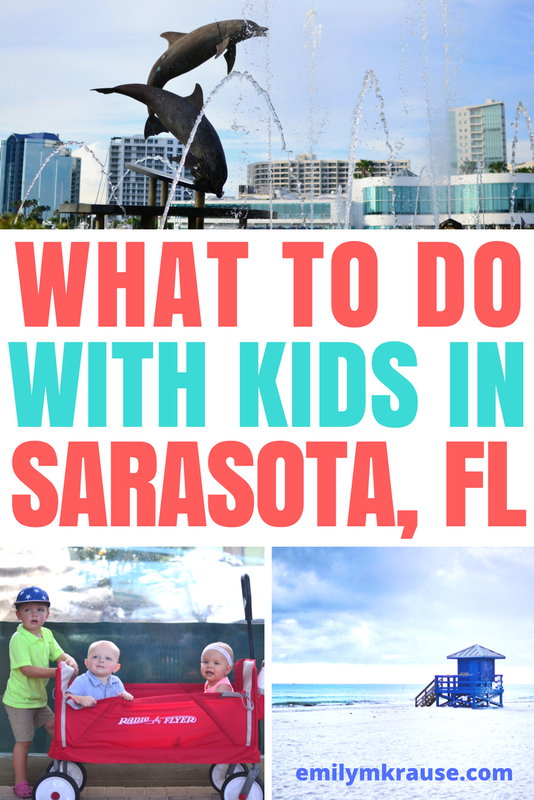 Here's how to make your time in Sarasota with kids totally worth it. In my opinion, this is a can't-miss spot in Sarasota. As a parent with really young kids, I know how impossible it can feel to enjoy eating at a restaurant. This waterfront restaurant is open air with a great view and a low-key casual vibe. The best part is that some of the seating is on sugary-soft sand where kids can run and play while you wait for your food. A friend recommended that we bring beach toys like shovels and buckets along to help occupy the kids. I sipped on my perfectly strong margarita while my boys played happily. I would honestly take a trip across the state just to go back to O'Leary's. I consider it a hobby to find the best ice cream in every city I visit with my kids. In Sarasota, that's definitely Big Olaf Creamery. They serve handmade ice cream, shakes, and malts, and we loved taking our ice cream outside to enjoy in the Adirondack chairs outside the restaurant. If your kids are obsessed with sharks like my 2-year-old son, they will love their experience at Mote Aquarium. It actually has two separate buildings, so we started in the main building which contained jellyfish, sharks, and two touch tanks. The second building had three lively otters who loved doing their flips and tricks for our kids. The lady at the front desk informed us that the otters love red wagons for some reason, so we were really in for a treat! The second building also had a manatee, who we got to watch eat a head of lettuce, giant turtles, and an alligator. We always love to find free and cheap things to do when we visit new cities, because let's face it: having kids and traveling with kids are expensive! Usually, parks are the perfect option. Bayfront Park is located near the Ringling Bridge and offers a playground, splash pad (Children's Fountain), and walking paths for families to enjoy. We didn't get a chance to play in the splash pad since we enjoyed this area in the evening after dinner at O'Leary's Tiki Bar. However, my kids loved climbing on the playground, which I was delighted to discover had a crawling area for babies and toddlers. After the kids finished playing, we strolled along the trails and admired the Sarasota skyline and the gorgeous views of the bay. I know, it doesn't necessarily sound like somewhere you would want to take your toddlers or little kids, but these botanical gardens have several spots specifically for little ones. The Children's Rainforest Garden is a wonderland for even your youngest. There are places for the kids to climb, run, and explore, and plenty of benches for the adults to rest. You can also pick up a plant scavenger hunt for kids to fill out while you wander around and admire the flora and fauna. Don't forget to check out the butterfly gardens at the end! There are a few barrier islands off the coast of Sarasota which offer some of the world's most beautiful beaches. A few years ago we got to visit Lido Key, and this time around we explored Siesta Key. I love these beaches for kids because the sand is white and soft so it doesn't get too hot for little feet. The Gulf of Mexico waves are gentle so it's easy to take the kids out into the water to play. 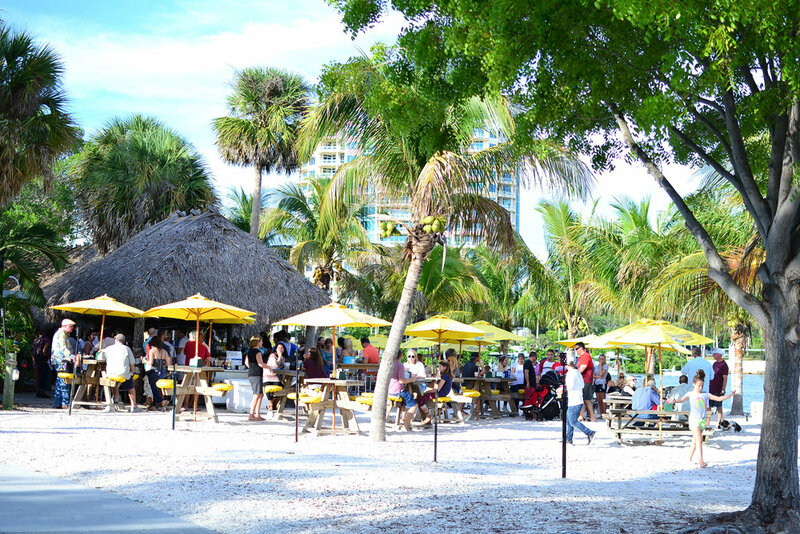 The beaches also have ample free parking, picnic tables and grills for a lunch at the beach, and pavilions in case it rains. We also had fun wandering around Siesta Key Village where there are tons of shops, tiki bars, and restaurants. We stopped for ice cream at Big Olaf Creamery and enjoyed people watching out on the porch. The Ocean Blvd strip is where you'll find everything, so find a parking spot and start strolling! Unfortunately, it started pouring the moment we walked up to Big Cat Habitat so we didn't get to experience this, but I've heard awesome things about it! It's a large animal rescue where they train bears, lions, primates, and even a liger using positive reinforcement. From the little time I spent chatting with the workers, I noticed how excited they were to share their passion for and knowledge about the animals living at Big Cat Habitat. NOTE: Only open Wed-Sun from 12-4 so plan accordingly! Also be sure to check on the website for demonstration times to get the most out of your experience. St. Armands Circle is on Lido Key and is an upscale shopping and restaurant area. Even if you have young kids, there are a few more casual dining options, too. Check out all the Greek statues around the circle, too! How long do you need to properly experience Sarasota? Well, that depends. We only had a weekend to fit everything in, and I felt like we were incredibly rushed. If you're going for a legitimate beach vacation and also want to include lots of activities and outings, I would highly recommend 5-7 days. If you're going for a quick stop just to get a feel for the city, 3 days should be plenty. You'll just have to pick and choose what you want to experience! Since we have friends in the area, we've never actually stayed in a hotel in Sarasota. I researched a few family-friendly options and loved Hilton Garden Inn Sarasota Bradenton Airport Hotel, Embassy Suites Sarasota, and Siesta Key Beachside Villas. Also, don't forget to check out AirBnB as an option! It's so nice to stay in a home where you have multiple bedrooms for putting kids to bed and you can cook a lot of your meals to save money. If it's your first time using AirBnB, make sure to use my referral link for a $40 travel credit! Just an hour north of Sarasota, Tampa is another fun waterfront city with tons to do for families. Busch Gardens is a large theme park with roller coasters and a special area for little kids. The Tampa Riverwalk is an awesome promenade lined with parks, museums, restaurants, and splash pads. And don't forget ZooTampa! Fort De Soto is touted as one of the most family-friendly beaches in Florida with its pirate ship playground and natural tidal pools for kids to splash in. Find pavilions, picnic tables, cafes, and more here. Don't forget to check out the historic fort, or even go camping! Known for their incredible beaches, St. Pete and Clearwater are also fun getaways. The Clearwater Aquarium boasts the dolphin from Dolphin Tale and includes touch tanks, sharks, and otters. The Pier in St. Petersburg is awesome, too! If your kids are into LEGOs, make the drive to visit this theme park. Created just for kids, there is a water park, exciting rides, and entire detailed model cities built entirely from LEGOs! What did I miss? 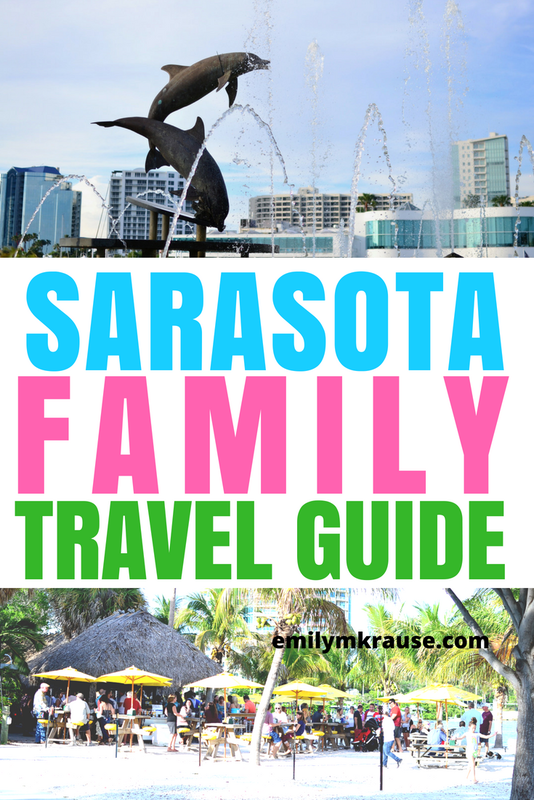 What's your favorite thing to do with kids in Sarasota?